itS mY LiFe !!!!!!... : Dusk or Dawn?? 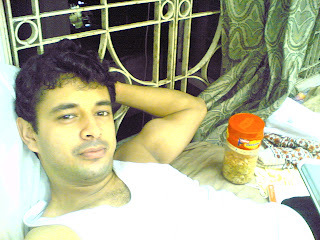 Place: On my bed leaning besides the window. It is raining heavily outside, with intermittent drops coming through the window gently falling on my face. Apart from the voice of the leaves enjoying the rain on them, there is complete silence. The effect of the hour, soothing rain and the silence is unimaginable. It’s a kind of trance where I am not sleepy, yet eyes are half closed. The titillating breeze keeps me up while the lullaby of rain tries to pulls me down. The laptop tires me down, while the cheeslings keep me awake. And then I hear the local train blowing in the far, the plane go up above me and the bells ringing in the temple below. Elsewhere, it is time for people to wake up and here on the window side, amidst the rain, it’s time to lay down. The lights go dim here while far away the orange color starts to appear. Good Night..or should I say Good Morning!! Your situation can be imagined Sid. Good narration. @cuckoo: haan..yesterday also it rained at nyt.. err.. morning..